I live in Guelph and was very fortunate to see this bird. Hello Angie, I'm not an expert, but to me that looks like an albino Crow. I can't think of a white bird of that size that would be around here. Perhaps one of our readers might know what it might be. I will also post this on our facebook page and we may get some information from there. How Awesome is this Bird!!! You are so lucky to have such a bird land in your yard for a visit! I to have just had the most amazing little feathered visitor. 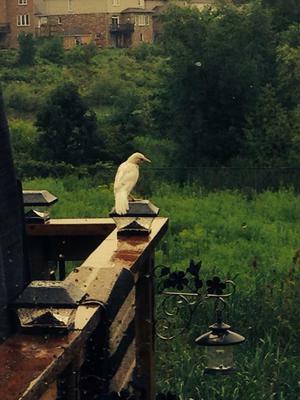 Its just amazing, to think its an albino crow? I've taken pictures into wild birds unlimited and they are great in there. Very cool though. It doesn't look like anything I've seen before. It certainly looks like an albino crow. They are very rare!